The best thing about summer is being able to grill and eat outdoors. Here, in New Jersey, we only get to do that for about 3 months out of the year, and sometimes it's too hot and humid to want to be outside, that's when air conditioning is king. 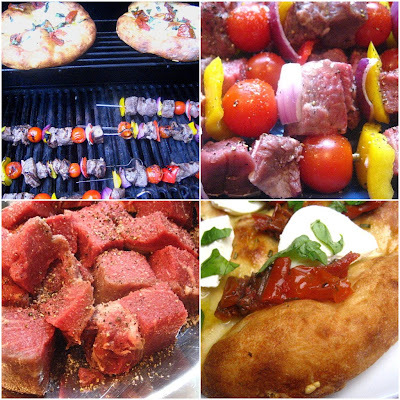 I made these excellent filet mignon kabobs and grilled pizzas for a weekend BBQ. Served up with some easy corn & asparagus salad and a big bowl of potato salad, and summer never looked so good. About an hour before grilling, salt and pepper your beef cubes and keep them on the counter at room temperature. 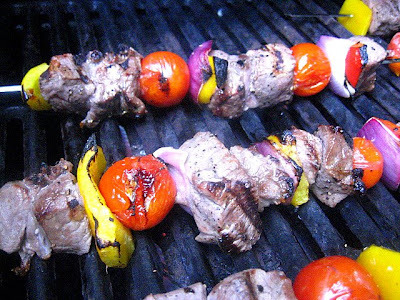 Thread your skewers, alternating vegetables and meat. 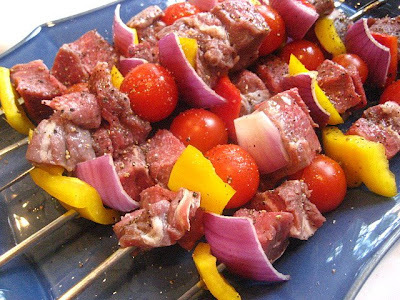 Put a little more kosher salt over the vegetables and meat skewers and drizzle with olive oil and squeeze a lemon or lime over the kabobs on a platter. Grill on medium-high heat to your desired temperature. 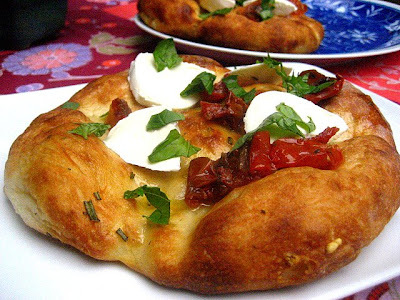 I purchased fresh focaccia bread and drizzled with olive oil. Place sliced fresh Bufala mozzarella pieces on top & roasted tomato pieces. Finish with fresh basil and place on the top rack of your grill, while the kabobs are cooking. I just realized that my blog turns one year old today! Have a safe and happy 4th of July weekend with your friends and family! the first anniversary is paper so shuffle a bunch for me - happy first birthday. I know time flies... but this year did MORE than fly. A fantastic creation with sensational food and photographs. Happy Anniversary Stace! Congrats, your blog is terrific! And I just saw your grilled asparagus and corn salad as Top 9 at Foodbuzz today. Whoo Hoo! 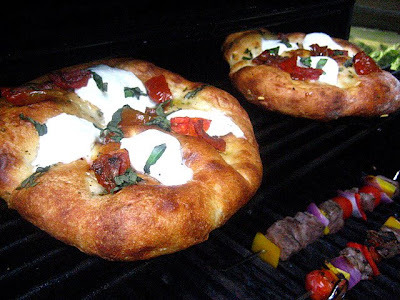 PS - Wish my grill were working - I really want to make grilled pizza! Happy blog birthday Stacey! Doesn't a year just fly by?? Great grill food, like those pizzas. Congratulations on your First Anniversary in Bloggerland! Happy bloggerversary! I've so enjoyed reading you over the last year, your photos are beautiful & recipes delicious! Happy Blogiversary Stace! Is it just a year? Your blog has been an inspiration to many, your cooking and personality shines through with every post, and might I say, your posting is off the charts! My mornings wouldn't be the same without checking Staceys blog first, along with my coffee. It's been a joy to know you and I look forward to another year of Stacey Snacks! Cin Cin!! Happy Blog Day! And these recipes are something to celebrate with...yum. Happy Anniversary! My family has never eaten better since your blog came into being . . .
A happy and safe 4th to you and your family! Happy 1 year Anniversary to your blog! Please keep up the GREAT recipes and tips! Happy 1st! that grilled pizza looks yum! One year! I'm so glad that I discovered your food blog. I have enjoyed so many of your recipes, and I've made several. You got me into the habit of antipasto, and you've inspired me to improve my photos. I love ya, "Sta"! One day, I'm flying East and your doorbell will ring on a sunny Friday. Congratulations on your one-year blogiversary. I can't believe how you've kept up such high standards with the frequency and quality of your recipes. You're an inspiration. Now if only I could get some of that pizza or filet mignon kebobs right now - it's dinnertime and I've got no energy to cook. No way- only a year??! You got this thing down, girl..!! Happy blogiversary! Like Proud Italian Cook, my mornings wouldn't be the same without you, I've learned SO much! Happy Blogiversary! I didn't realize you've only been blogging for a year. Here's to many more great posts. Love the grilled pizza. Happy Anniversary, and happy 4th of July! Happy blog anniversary!! We totally forgot our until weeks later! That pizza looks amazing! Have a fun 4th! Happy blogiversary to you! It's amazing how much you have accomplished in a year. Look foward to the next one! I love kabobs and these grilled pizza looks so different! Surely everything is yummy! Happy Blogiversary! That grilled pizza looks amazing! Happy Blogiversary!! Awesome pizza too! Happy Blogiversary! Great ideas here! Happy one year blogiversary!! Love the filet mignon kebabs- yum! !